All too often when buying or selling a home we run across a number of different real estate terms that we don't usually encounter in our day to day lives. In this post I define/explain many of the common terms you will come across during a real estate transaction. An appraisal is the process of evaluating a piece real estate (can be a residential, commercial or industrial building built on land) and all it's features to come up with a value of that property. An appraisal is normally performed by a professional appraiser who is trained to provide their opinion as to the value of the real estate and its building. The appraisal report an Appraiser provides is normally used by banks for purposes of determining how much money they will lend for a person to buy the property. If the value of the real estate is appraised lower than the amount requested for a loan to purchase the property then the buyer will have to come up with more money out of their own pocket, the seller can reduce the selling price or depending on the terms of the contract the deal can be cancelled. An appraisal report can also be used by an insurance company to determine premiums and reimbursement cost in cases of building damage or destruction. For more information on Appraisals and the Appraisal process visit the blog post "How the Appraisal Works in the Home Buying Process" by Shannon Slater. A back-up offer on a real estate property is an offer that will only be considered if the offer that is pending at the moment falls through. The primary offer can fall through for any number of reasons like inability to secure financing, inspection issues, appraisal issues and more. Any good back-up offer is written such that the buyer still is protected and will go through the process of getting the home appraised, getting a home inspection and allow the buyer to conduct their own walk through to ensure the home is still in similar condition as when the back-up offer was originally made. A licensed real estate sales agent who is exclusively representing the buyer in a real estate transaction. See also Dual Agency and Seller Agent. 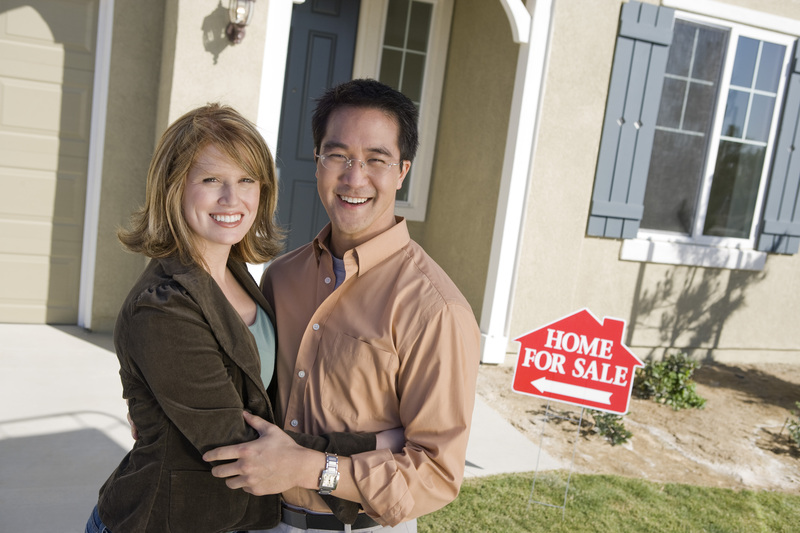 Closing is when the real estate property that is being sold is transferred to the new owner. The transfer usually happens after all financing, valuation and inspection activities have taken place and the buyer, seller and lenders are happy with the numbers related to financing and Closing Costs. The seller and buyer will sign paperwork related to the new and old mortgages and also sign paperwork to transfer the title of the property into the new owners name. After the closing is done the title company that is involved in the closing process will have the new deed recorded with the County government. The Closing date is usually set for in the purchase offer contract. The date is usually selected to allow enough time for the mortgage lender, appraiser, home inspector and others to do their work prior to the property title changing to the new owner. Closing costs are the fees paid by the buyer but sometimes can be paid by the seller when a property is transferred at closing. Closing Costs normally associated with Closing on a property include loan origination fees, attorney fees, title fees, appraisal fees, survey fees, escrow deposit, recording fee and a number of other fees which are dependent on the lender and closing company. In some situations the seller of a property can be asked to contribute towards closing costs and in some cases even pay all of the closing costs. Where the market is more of a Buyers Market you will see more requests for seller paid closing costs as part of the offer. In the case of a contract to purchase real estate the buyer is agreeing to buy a home from the seller and the seller is agreeing to sell that home. Contracts for the sale of real estate generally have to be in writing. Most real estate purchase contracts also contain language which sets forth additional requirements and criteria like meeting appraised value, inspection issue repair requests etc. etc. It is always recommended that you as the seller or buyer read through the entire contract you are signing. While you may have a professional assisting you with the transaction ultimately you are the one signing on the bottom line and legally obligating yourself to perform in a certain manner. If you have any questions about the terms of the contract you should ask your real estate agent or consult with an attorney who specializes in real estate transactions. See also When Should You Hire a Real Estate Attorney? A counter offer is a proposed change to the original offer and in real estate is generally considered a new offer invalidating the prior offer. For example a buyer comes along and offers to buy a sellers home for $300,000 dollars subject to appraisal, home inspection and that the washer and dryer be included as part of the sale. The seller makes a counter offer to the buyers by stating that they will take $305,000 dollars for the home subject to appraisal and home inspection but will not include the washer in dryer in the sale. The counter offer the sellers have made cancels the original $300,000 dollar offer from the buyer. Therefore if the buyer rejects the sellers $305,000 dollar offer the seller cannot turn around and then accept the original $300,000 dollar offer from the buyer and expect the contract to be legally enforceable. Depending on State laws some real estate brokerages and some real estate agents are able to represent both the buyer and the seller in the same transaction. Not all States allow dual agency. Stricter rules and requirements are imposed upon the brokerage and real estate sales agents who are involved in Dual Agency relationships. Earnest money is a payment made to show that the buyer is acting in good faith and intends to complete a contract to purchase a home. In most cases earnest money is not required but is advisable in order to show that the buyer is serious about buying the property. Upon closing Earnest Money is credited towards the real estate transaction. 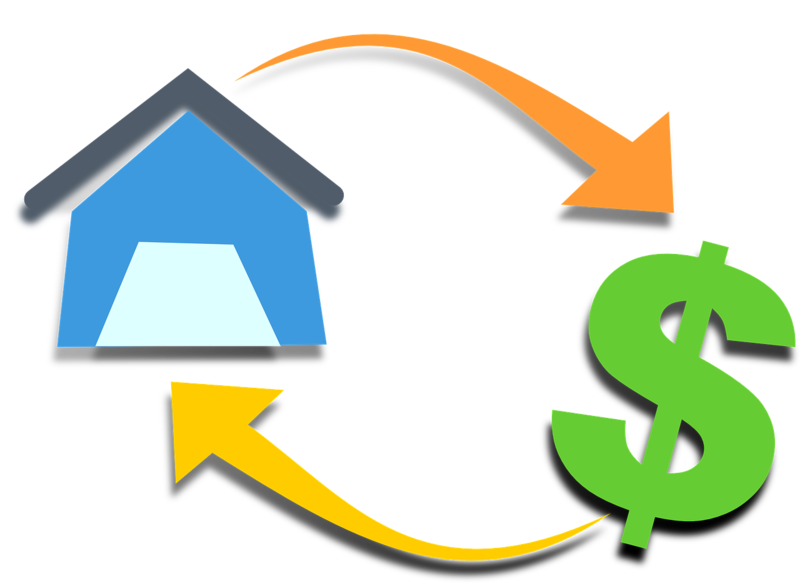 An Escrow Account is an account setup for the purposes of holding money to pay for things like property taxes and homeowners insurance. The Escrow Account is usually setup and managed by the creditor who is lending the money for the mortgage. The mortgage payment will include escrow payments in addition to the principal and interest payments made on a monthly basis. The monthly amount put towards the Escrow Account is usually based on the total of one years worth of property tax and insurance payments divided by 12. Lenders can also take some extra money in reserve to ensure the Escrow Account does not run out of money. Escrow Accounts are required for certain types of loans (FHA, VA, USDA, or loans for more than 80% of appraised value). Where not required the home buyer or homeowner has the option of having an Escrow Account or not. A Good Faith Estimate or GFE is a written statement detailing the terms of the Mortgage that you have applied for. The GFE should contain a list of fees and costs associated with the loan. A home inspection is the process whereby a home inspector will examine a home and all its major components to determine the quality of the components and also the home inspector will provide estimates of longevity and usefulness of the components. Home inspections can be performed on existing homes and on new construction homes. A home inspection is an education process for the client. The goal of a home inspection is not to see what the buyer will pay for or to fix items that may need repair. A home inspection is designed to inform buyer of everything discovered in the home in order to give the buyer a better understanding of the home and it's components, how to maintain and take care of the home, and to help the buyer have a better idea on whether or not they wish to proceed with the home purchase. A home inspector will never tell a buyer whether they should buy the home or not. An inspection on an average home of about 1400 square feet should take about 3 hours. The inspection process will include the buyer walking through with the inspector asking questions and the inspector going over everything they find with the buyer. The goal of a home inspection is to find major issues with the house including do it yourself repairs that may be lacking. The home inspection report will be a detailed report of the condition and quality of the house as well as will have 50 to 100 pictures of the home showing areas of concern and positive areas as well. Information and details for Home Inspection was provided by Todd Engle of GoodEyeInspections.com. A Home Showing is when a buyer and their real estate agent walk through a home to view it in person. A warranty/guarantee offered on certain parts of the home that may include heating and cooling systems, plumbing, select appliances, and electrical system. Always check the home warranty information provided to you to see what is covered and what is not covered. Warranty coverage levels are usually offered at different tiers of coverage based on the amount paid for the warranty. The fees for the warranty vary based on the type of coverage and which warranty provider is used. Fees for the warranty are generally billed on a yearly basis and claims usually are subject to a deductible. A Mortgage (also known as a Mortgage Loan) is a loan used to help purchase a piece of real estate. The real estate is used as collateral for the loan where in the event of a failure to payoff the loan the Mortgage lender can use the real estate to help pay off loan amounts that may still be owed. An Open House is an event whereby a real estate agent or a homeowner (if selling for sale by owner) opens the home for the general public to come through and view the property. Generally no screening is done on who comes through the home during an open house. An open house may be beneficial if the home is in a highly sought after area. For more information on holding an Open House and whether or not to have one see To do or not to do: Open House. A Pre-Approval letter from a mortgage lender usually states that the buyer will be able to borrow a certain amount of money in order to buy a specific specific piece or real estate. The Pre-Approval process involves an in depth look at a buyers financial situation and generally requires providing tax returns, W-2 wage forms and more to the lender for verification purposes. A Pre-Approval letter is not a 100% guaranteed commitment to lend money for the buyer to purchase real estate. If the buyer fails to keep up their credit worthiness or takes out additional loans or lines of credits prior to closing of the real estate sale the mortgage loan to purchase the real estate can be denied. A Pre-Qualification letter from a mortgage lender basically states that you as the buyer are likely to qualify to borrow a certain amount of money to buy real estate with. A Pre-Qualification is not an in depth credit and asset analysis of the buyer, but instead speaks more generally towards credit worthiness of the buyer. After a Home Inspection has been completed there may be a list of items the home inspector noted as needing repair or replacement. The buyer has the option to submit a request to repair to the seller and have those issues replaced or repaired at no cost to them. In order to keep the home sale from failing the seller should complete the repairs, or the seller could offer to reduce the price accordingly if they are unable or unwilling to complete the repair. The buyer and seller must agree in writing to any changes or repair requests that are requested as a result of a Home Inspection. If the seller refuses to complete the repairs the buyer can walk away from the deal and cancel the offer provided the purchase contract had language in it which covered the home inspection and repair requirement. A Purchase Offer is the initial document or verbal statement in which a buyer will list out the terms and conditions of their contract to purchase a home. A Purchase Offer will become a contract only if the seller has accepted all terms as presented. Any changes to the Purchase Offer by the seller is considered a new offer to the buyer who then must accept or reject those changes. While the Purchase Offer can be made verbally the actual contract to purchase real estate must be in writing. A licensed real estate sales agent who is exclusively representing the seller in a real estate transaction. See also Dual Agency and Buyer Agent. 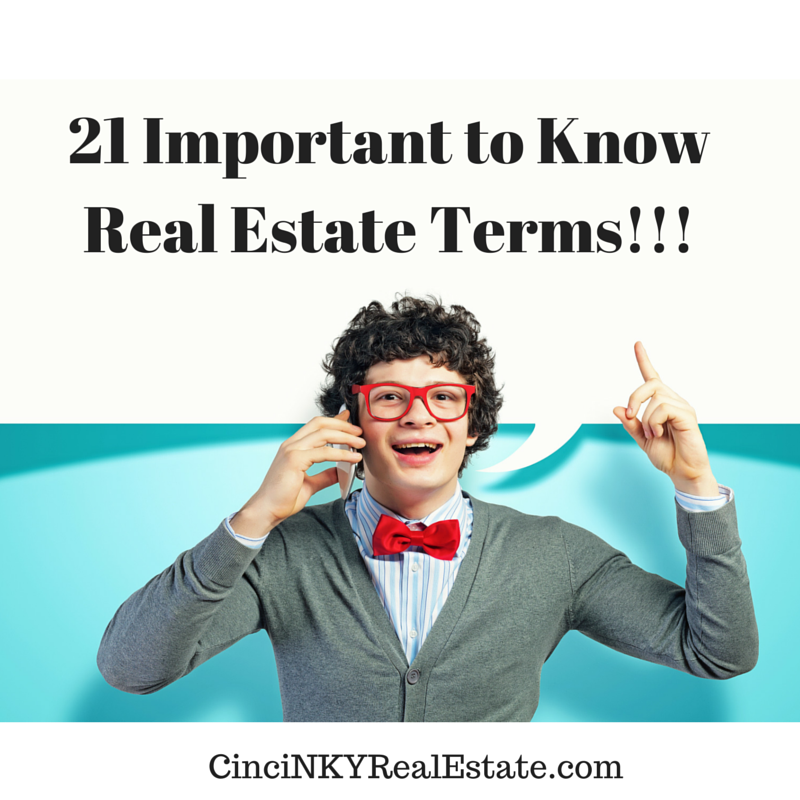 About the author: The above article “21 Real Estate Terms You Should Be Familiar With” was provided by Paul Sian. Paul can be reached at paul.sian@herrealtors.com or by phone at 513-560-8002. With over 10+ years experience, if you’re thinking of selling or buying, I would love to share my marketing knowledge and expertise.